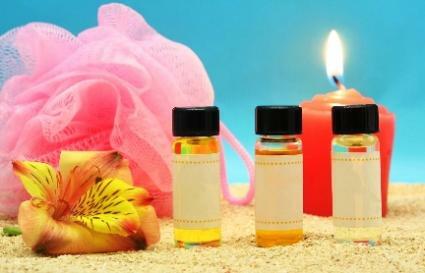 Fragrance oils are concentrated scents used for perfumes and other scented products. Although they are found in many bath and body products, never apply scented oils directly to the skin unless the oil has been diluted. Fragrance oils are blended synthetic aroma compounds or natural essential oils diluted with another type of oil or alcohol. Fragrance oils are also referred to as aroma oils. Essential oils, by contrast, are extracted from natural plant sources, so they are not synthetic. Aroma oils are combined with essential oils and other ingredients (including alcohol and water) to create perfumes and home scents. Oils can be added to a bowl of warm water, simmer pot, candle burner or lamp ring for room freshening. Additionally, aroma oils give new life to a candle or potpourri by adding a couple of drops to refresh the scent. Aromatherapy employs plant oils for the benefit of emotional and physical healing through the sense of smell. Applications include candles, incense, and massage oils. While fragrance oils are largely marketed for aromatherapy usage, there is some disagreement about whether or not a synthetic product provides the health benefits that a natural product (essential oils) provides. If you are seeking scented oils for aromatherapy purposes, carefully research the ingredients. There are a number of web sites that sell fragrance oils for consumer use, as well as products that incorporate scented oils. Saveonscents.com - offers over 1,200 fragrance oils, incense, bath, and body products to choose from. Oils are available for candle and soap makers, as well as those interested in creating customized perfumes. Choose from manufacturer's grade or cosmetic grade - each differ in concentration and vary in their application (candles, soaps, lotions, etc.). Samples are also available. Thescentwizard.com - offers over 1,500 scents for various products. Nature's Flavors - the largest collection of scented oils online, provides quality scents for candle and soap making. The Body Shop Lavender Home Fragrance Oil -- add drops of this oil to either an aroma burner or lamp ring. The Body Shop Natural Soapstone Oil Burner or The Body Shop White Pod Ceramic Oil Burner -- drops of oil can be added, with a tea light placed below that heats the liquid to release the fragrance. The Body Shop Lamp Ring -- add a few drops of fragrance oil and place on a light bulb to warm and release the scent. Always test fragrance oils before you use them. Fragrances vary depending on supplier, and may include more synthetic ingredients than others. They can include up to 80% essential or natural oils, but for the most part, aroma oils are artificial. Since scented oils cannot be patented, they are covered only by trade secret laws, meaning the formula and ingredients do not have to be listed. There are few regulations in the scented oil industry, but there are banned chemicals and organizations maintaining the safety guidelines of materials. For example, The Research Institute for Fragrance Materials (RIFM) evaluates fragrance materials and publishes findings in a scientific journal. The International Fragrance Association (IFRA) represents international fragrance manufacturers by publishing guidelines and evaluating the industry.